U. S. colleges and universities are expected to spend $6.6 billion on IT this year. Budgets remain tight, and competition for talent is fierce. “Hiring and retaining the IT workforce” has been in the EDUCAUSE Top 10 Issues list for the past 5 years, and the Higher Education IT Workforce Landscape report tells us half of our IT staff members could be looking for a new job. This is concerning information at a time when IT is being called on to support innovation and accommodate new approaches to service delivery and analytics. 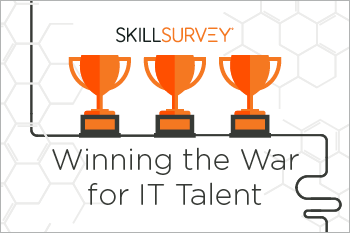 Win the tech talent war with data-driven hiring. Download our eBook now.